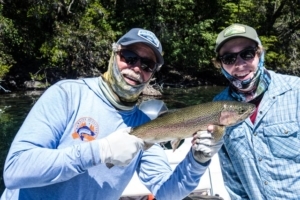 Tips and Techniques for fly fishing in Patagonia! 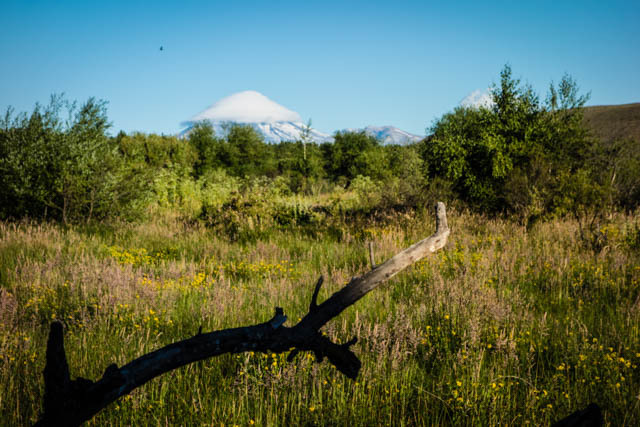 On my recent tip to Rio Manso Lodge in Patagonia near San Carlos de Bariloche, I had some eye opening experiences. I learned a lot about the dragonfly hatch. I learned some tips and techniques from the guides there that showed me ways to catch trout unlike anything I’ve seen in Michigan. 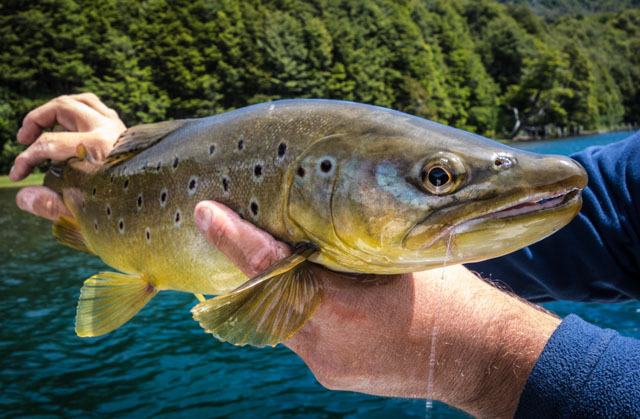 Fishing the dragonfly hatch in Patagonia will blow your mind! Those of you that know me realize that I’m an unapologetic streamer junky. 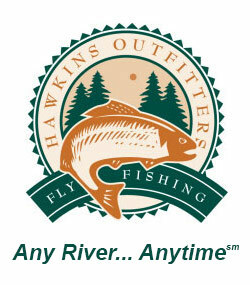 If I go fishing I throw streamers unless I see good fish rising to dry flies. Fly fishing in Patagonia I’ve always brought my streamer staples, Nutcrackers, Hat Tricks, Triple Doubles and Lapdancers. These streamers, along with some simpler, bugger kind of stuff, has yielded me many large fish all over Patagonia. 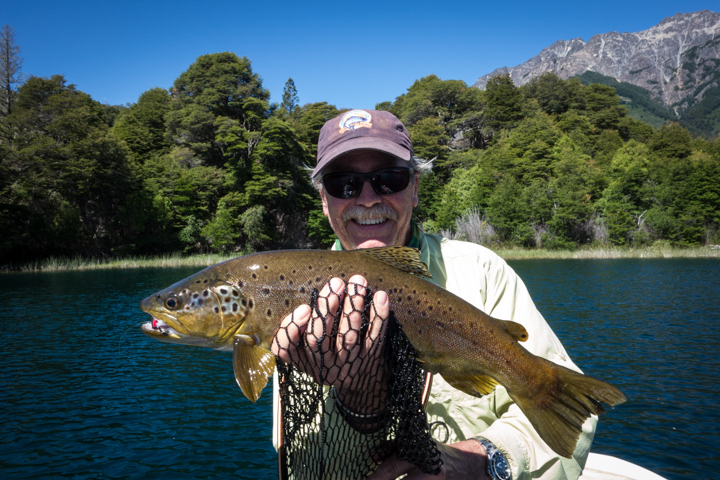 On this, my most recent trip to Fly fish in Patagonia, dry flies were king. We left Michigan a couple days after Christmas on the advice of John Bleh. 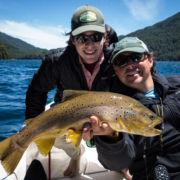 He’s the marketing director for Rio Manso Lodge near Bariloche. John advised that we would hit the dragonfly hatch. This hatch is like having an all day hex hatch. We caught brookies to 22 inches, rainbows to 24 and brown trout to 25 inches. Fishing dragonflies is different then most other dry fly fishing I’ve done. The dragonflies are hatching mostly near the reed beds so that’s were the majority of the action happened. We were fishing mostly 2X, 9 foot leaders. You would cast as close to or even into the reed areas and twitch the fly. If you were in the reeds a very light touch would allow you to work the fly through the reeds and clear it before casting again. If you pulled you hooked the reeds, which were very unforgiving, you had to row in to retreive your fly. That alerted the fish to your presence and “blew” that area for awhile. The other different thing to learn was the set. Most of the time the fish blew up on the dragonfly imitation, many times going straight up in the air with it in their mouths. So you set on fish flying through the air. A different method, but very cool. It’s hard to describe the excitement of the dragonfly hatch and its importance in fly fishing Patagonia. One of the best patterns was a staple in our boxes here in Michigan, it’s our Damsel Pattern (see video below) , invented by Jon Ray. In this video I will show you how to tie this dragon fly, damsel fly pattern. We tie it in three colors, black, blue and green. The black variation was dynamite for the dragonfly hatch recently. 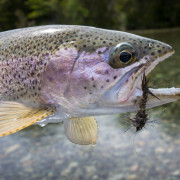 If you love dry fly fishing, big trout and explosive takes, fly fishing in Patagonia for the dragonfly hatch is for you. Join us next year!